You computer has two processors. Main processor (called CPU) that handles most of the tasks you do. And Graphical Processor (called GPU), which is very powerful these days. If you do not play some 3D computer game, your GPU does almost nothing. 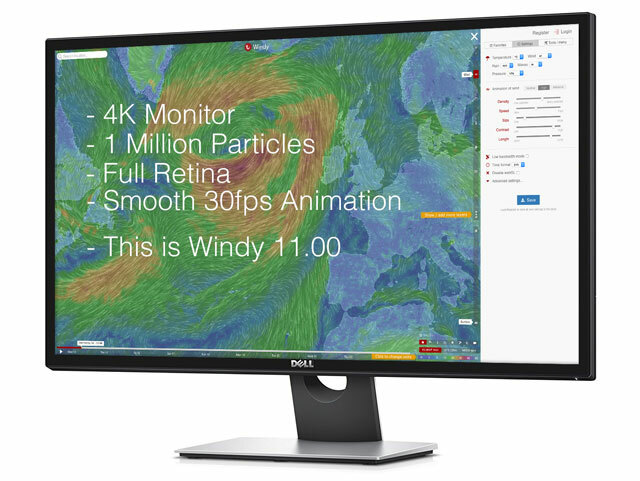 We harness the power of your GPU and use it for animation of wind and wave particles across your screen. Particles are therefore faster, more smooth, with full retina support, but what is the most important, your main processor (CPU) is now free to do another Windy tasks. This new technology is called webGL and if your browser does not support it, we render wind particles in the old way. If you will have any technical issues with webGL go to the Settings and switch off the webGL support. Much faster and better screen show. I like it, smoother, faster. the time slidebar is covered by tools menu. Looking good, much more faster map scrolling, i like it!!! Thank you for the continuous improvement of Windy. Much more faster .Very good job guys. Looks faster and smoother. But nothing still happen in the 3D mode (as it was with the pure CPU version).